Many marines can't take bright lighting, e.g. 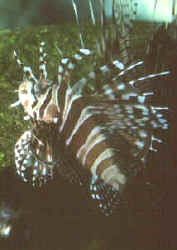 the Lionfishes. As important as lighting is to the appearance, health of livestock and cost of marine aquarium keeping, it is not surprising that it is an oft-discussed topic. What is shocking to me is how much ignorance and dissonance surrounds illumination. There really is a giant difference between what looks good to humans and what is functional in marine systems with or without photosynthetic organisms. For looks; "beauty is indeed, in the eye of the beholder", but the same buyer ought to be aware and beware. The ambient amount and quality of light energy that reaches various ocean depths has been accurately measured; and technology exists to replicate, even better, these conditions in captivity. So why the proliferation of lighting fixturization, lamp types, wattages, timing devices, and controversy about what is best? And wherefore the lack of success given all the money, burned hands and big energy bills? Perhaps it's our ignorance regarding proper light and lighting. Arguably a chief input to keeping saltwater systems, though not the only critical one, is light. This form of energy is poorly understood and manipulated by aquarists. Fixtures and lamps (we'll use the generic term for all artificial light sources; bulbs, tubes, etc.) generally provided in the trade are inadequate for saltwater aquaria. Lighting is way too often of the wrong spectral mix and too low in luminosity. But don't despair. Light/lighting is not difficult to grasp, and fixtures and lamps that provide optimum illumination are to be had at modest cost. For the Conscientious Marine Aquarist light and lighting provide two functions; 1) aesthetic and 2) functional, or put another way; 1) illumination and 2) health benefits including possible photosynthesis. The former is a matter of taste; what you, the aquarist considers beautiful. The latter is a matter of science and economics: given the depth and given conditions of a system, providing the quality, quantity and duration of light is "simply" a selection of what your organisms require and what you're willing to spend. It is imminently important that you understand the above (please re-read it until you can explain to anyone) along with some basic theory of what light is and how it "works" in water in order to be successful with marine aquaria, and to keep from going broke. As you will see, the best available, most appropriate lighting technology for Conscientious Marine Aquarist is simple, straight-forward, relatively inexpensive to purchase, operate and replace, and has been with us quite a long time. As with all communication, it is necessary for us to share common symbolism; for us to define certain abstract terms. Bear with me, Dear Reader, for a brief review of what's germinal to understanding our subject of light here. Light is generally considered to be the visible (what we can see) portion of the electro-magnetic radiation (EMR) spectrum. Do you recall the presentation of light, EMR as "waves", or wave functions? Wavelengths are the distance between the crests (or troughs) of these waves. The wavelengths of visible light extend from about 4,000 to 7,000 angstroms (one angstrom equals 10-10, or 0.000 000 000 1 meter, a billionth of a meter). You may have encountered another unit of measurement, the nanometer (abbreviated as Nm), defined as 10-9 or 0.000 000 001 meter. Visible light as measured by this unit of length is 400 to 700 nanometers. EMR smaller in wavelength than visible light (@380 Nm) includes Ultraviolet Radiation (UV) (and x-rays, gamma rays, cosmic rays) is diagrammatically placed on a chart to the left of to the visible spectra (wavelengths). On the other (right) side of the scale is electro-magnetic radiation wavelengths greater than visible light (@780+ Nm). This is the realm of Infrared, microwave (radar), television, FM, Short Wave, AM and other radiation. There is a related measure of EMR waves we need to be concerned with, frequency. Simply put, this is how many waves of a wavelength propagate past a given point every second. This 'cycles per second' is the units we call Hertz (Hz). The important relationship between wavelength and frequency I want you to remember is logical. You know the speed of light is a constant; therefore the smaller the wavelength, the greater the frequency. Conversely with an increase in the wavelength, what happens to the frequency? Right, it gets smaller. The useful biological implications of these facts are profound. Reef-building corals and other photosynthetic organisms utilize light-capturing mechanisms in the form of photosynthetic ("putting together with light") pigments, like chlorophylls. The entire organic world runs on the energy translated and stored in photosynthesis. The combination of water and carbon dioxide (under favorable light, heat, nutrient conditions), re-formed as sugars and oxygen photosynthesis. The reverse of this reaction is respiration. The various light-using species can only utilize certain wavelengths/frequencies of light; notably in the orange-short red and blue parts of the spectrum, not the green and yellow that our eyes most appreciate. What does this mean? If optimizing health/growth of aquatic life is your goal, you want to provide energy of the needed/useful wavelengths. Other spectra may be desirable for appearance sake; others (UV and IR) can be innocuous to hazardous to you, your system and your livestock. Thus the quality of light is vital. How about the quantity of light? This is, of course as significant as quality. Too little or too much light is harmful. The duration, how long the light is on every day is our last light concern. Plants that hail from the tropics experience a more constant light regimen than ones from colder climes. Optimum conditions utilize an increasingly light morning to intense midday to decreasing afternoon, for slightly more than half-day light. These three measures of light, quality, quantity and duration are chief concerns of the Conscientious Marine Aquarist, indeed all aquarists. Thus we will cover them one by one. The final section of our discussion will 'throw light' on considerations of the costs of function versus looks in lighting the marine system. The quality of light is its composition, mix of spectra (wavelengths), or color, if you will. Let's review the prominent measures/features of light quality, so you can make apples-to-apples comparisons for yourself regarding the various means of lighting your system(s). Color Rendering Index (CRI) is an indication of how a light source affects the appearance of a standardized color chart compared with natural sunlight (under controlled conditions). Obviously, sunlight scores a big 100 CRI, with numbers approaching one-hundred being close to sunlight. See the accompanying chart for what the sun's spectral power curve approximates. For the sake of photosynthesis in aquaria, CRI values of ninety (90) or greater are called for. Color Temperature is a more difficult concept to elucidate. For our purposes, let's just say that this is an equivalent temperature of a star (like our sun) that would emit the radiation measured. Our stars sunlight ranges somewhere between 5,000 and 6,200 degrees Kelvin. We want a light source of 5,000 degrees Kelvin (some writers say 6,000) or greater along with a CRI of 90 or greater. Make sense so far? Let me re-emphasize; the pretty color rendered by "aquatic fluorescents" has nothing to do with functionality. You want a CRI of 90+ coupled with a Color Temperature of 5,000+ Kelvin. A note here on Spectral Shift. As they are used, all the differing light technologies change to known degrees in the percentages of what wavelengths they produce. Their luminosity decreases also, along with the preponderance of the desired spectral bands. We'll have more to say about this later, but what you'll want to provide and make adjustment for is that light quality degrades over use/time with all lamps. Otherwise known as intensity or photo-strength, the amount of light is just as critical as its quality. Light quantity is measured in lumens, the International Standard of emitted light. Please forget about the terms foot candle, and lux (ten foot candles). These are archaic measures of received light and not of much real use to the Conscientious Marine Aqarist. I'll go out on a/the proverbial limb and offer a general "rule of thumb" for how much light is enough, to approaching optimal, to more than can be useful but not harmful. My hesitancy is based on not knowing many factors that strongly affect your system's light requirements. Tall tanks (greater than twenty inches) require more light. Ditto for ones with lots of reef-building life, especially ones with mechanical surface disruptors (pumps, bubblers), staggered, shady decor arrangements, dissolved color, particulates.... Different photosynthetic species., adapted to differing conditions and traumas have differing light demands. Water color, carbon dioxide, carbonate, pH, temperature... and more also change the minimum/maximum suggested lumens. Be all that as it may, I suggest one to two watts of full-spectrum fluorescents, roughly equivalent to 50 to 100 lumens per gallon for most systems (sight unseen). For "super-systems" with C02 infusion, pH monitors/dosimeters, mega-algae and/or hermatypic (reef-building/photosynthetic/zooxanthellae-containing) coral densities, doubling (and then some) this number is not unrealistic. One last comment re the above. Be aware that the watts of energy consumed is not equivalent to watts of light energy produced. Luminous efficacy, the light output divided by the power rating of the lamp, expressed in lumens per watt, is an important measure. The waste heat from other lighting formats is largely the lost part of this equation. You don't want to pay for this waste-heat, it's consequences, or elimination. Lamps have rated life and lumen depreciation. The latter describes the loss of light production over the life of a lamp; all lamps produce less light as they age with use. Rated life is a value determined by experiment. It is the time in which half the test lamps burn out; this is much more than their functional life span. Four foot fluorescents are good for @ 20,000 hours, shorter lamps slightly less time. This translates to a good two years of 12-13 hours per day. Turning the lamp on/off frequently shortens real and functional life. The use of electronic ballasts extends the same. HO, VHO (Very High Output) and metal halide lamps suffer much more quickly and severely from lumen depreciation and rated life, as much as forty percent loss. Also known as light-dark cycle, photoperiodicity; it is the amount of time each day the light(s) are on. Most photosynthetic organisms used in marine aquaria originate from the tropics where day lengths don't vary much during the year. Within reason, 12-16 light-hour days are optimum, more especially if your quantity of light is on the low side. This is best determined by knowing what healthy specimens look like when provided adequate lighting. Regularity of photoperiod can be very meaningful. Experiments have shown that long dark or light periods (1-2 days) severely affect aquatic life, photosynthetic and otherwise. Use of Timers: Use of Timers: Get them, they're great; and fixtures with self-starting features. Some scientific culture laboratories even go so far as to utilize polarized light and lighting fixtures that travel overhead in an arc in an attempt to more fully copy Mother Nature. Pretty amazing, isn't it? So How Do I Get the 'Right' Amount and Type of Light @ The Lowest Cost? What fixtures and lamps can get you this magical mix of spectral quality with the greatest of ease? And why not just use sunlight? The last question first. Natural sunlight is ill-suited for most set-ups. Most of us live in houses, in the less-tropical parts of the world, and want to see our systems flourishing whether the sun's up or not. Besides, the sun has an annoying habit of over-heating aquaria for the reasons stated in the introduction. For these reasons artificial light sources are almost universally employed. I will specifically address the major types of fixtures and lamps available to the hobbyist in a couple of sections. For our objective here, I want to quickly dispense with the 'losing' technologies of incandescent, quartz halogen, metal halide, mercury vapor, and all other than full-spectrum fluorescent lighting. Incandescent Incandescent bulbs may provide many of the desired spectra needed by live plants, but the electrical cost of their operation per amount of light produced is dismal, their concomitant production of waste heat prodigious, and lamp replacement interval all too short. Some 'old-timers' swear by them, and they do work; but those folks have hot homes and high electric bills, not to mention trash cans filled-up with burnt out bulbs. Metal Halide & Mercury Vapor :Metal Halide & Mercury Vapor technologies are not for the mainstream marine aquarist. Though some types of metal halides produce good quantities of the desirable qualities of light at a low enough cost, they also many drawbacks. Let me name the most notable: 1) They cost big bucks to acquire and operate, 2) Generate an abundance of ultraviolet radiation. Make sure you employ units engineered for marine systems, and utilize the ultraviolet filters provided. For the sake of your aquatic charges and your own health, you should be wary of too much UV exposure. 3) They're hot; take care not to burn yourself or your house to the ground. Much more about this under the "Fixture" section. Full-Spectrum Fluorescent lighting. In standard, as contrasted with High Output (HO), and Very High Output (VHO) ballasted formats has been and still is the best available, most appropriate lighting technique for 99.99% of aquarists. It provides the best quality and quantity light at the lowest up front, operational and replacement cost. Period. And now to give credit to where credit is tremendously due, my specific and whole-hearted endorsement for the all-fish marine, reef system, planted aquarium, palludarium, vivarium lights par excellence: Duro-Test Corporation's Vita-Lite (c) and Vita-Lite Supreme (c). The original Vita-Lite hit the market in 1967 (!) as the world's first patented, natural-daylight-stimulating fluorescent tube. For over twenty five years (until the advent of their Vita-Lite Supreme) Duro's Vita-Lite was the closest simulation of natural daylight ever created by anyone, anywhere. (No, I'm not being paid for this plug) Specifications: 5500 K, 91 CRI, 2180 Lumens. For folks looking for more luminosity Duro-Test offers another lamp, the Vita-Lite Plus; the only specification difference being the generation of 2,750 lumens. The Vita-Lite Supreme offers 5500K, a CRI of 96 at 2000 lumens; it is the best match yet to natural outdoor light. These are great (the best available) lamps for the marine aquarist, aquatic gardener, herptile keeper, photographer wanting to skip filters, and human work place. They grow aquatic organisms better than any other light system, without specialized fixturing at the lowest cost. What is more, your fishes and phtosynthetic organisms look and live better under these lamps. Yes, these products are that good. You can reach Duro to find your nearest dealer by dialing 1-800-289-3876. Also, in all fairness, I'd like to mention three other manufacturers of full-spectrum fluorescents. They are Philips with the Colortone 50, General Electric with their Chromaline 50 and Verilux with lamps of the same name. These companies also 'private label' full spectrum lamps for other labels. You will have to look for the CRI, Temperature in Kelvin, Luminosity in lumens, power curve, and average life ratings to make your own consumer judgments. Some information regarding 'other' types of fluorescent lamps. Be wary of lamps termed wide of broad spectrum. These are not the same as full-spectrum lamps which provide the total range of necessary spectra, including some UV. Daylight, cool-white, warm-white similarly are not full-spectrum and used by themselves will not support hermatypic (or endo-symbiotic algal) life. Cool white lamps, which are the most readily available for home and business use are the most efficient for their intended use; that is, they produce the most lumens per watt of energy consumed of human-visible light . The wavelengths produced are not suitable for aquatic systems. Cool Whites have a CRI of 62; yes, a pathetic sixty two. I'm not saying that other lighting formats are a scam; my point is hopefully clear: Other light types may be better looking to any one person; that is a matter of taste. For the purpose of keeping, growing, and showing marine aquatics, full-spectrum fluorescents are by far best. Fixtures can be made or bought at reasonable cost, with little down-side of over-heating, burning you or your abode. The lamps suggested have functional life spans of about two years. The spectral shift and lumen depreciation are tractable and easily adjusted for. Lamp Rotation: Lamp Rotation: For the purposes of Spectral Shift and Lumen Depreciation was mentioned previously. Allow me to reinforce the need for replacing full-spectrum lamps, used on up to a 14 hour light 10 hour dark regimen, every two years. Label the lamps, their fixture, a time-coded device in your personal computer... to keep tract; but don't wait until your photosynthetic life starts paling/bailing to check on your lamps. Also, although we'll cover fixtures in the piece after next I want to make sure and mention the advantages of direct exposure of the lamps to the waters surface. Do your best to keep nothing between the lamps and the water; all such barriers reduce light transmission and phase shift the light. So there you have it, a long snapshot view of what light is, the quantities and qualities of light that are of import to the Conscientious Marine Aquarist, and how to reason and apply what you need in the way of lighting to have a system that looks great, keeps your livestock healthy without putting you in the poor house. If you're into high technology looks, and don't mind paying for them, there is no end to fixtures and lamps (quartz halogen, metal halide, mercury vapor; High Output, Very High Output fluorescents, actinics, -lux lamps, ad light-nauseum). These are fine for what they're good for: appearances. Kudos to foreign writers and their readership who have the discipline to fool with these fixtures, acculturate livestock to their luminosity, prodigious heat and U-V outputs... For most Americans? The winning technology has been and still is full-spectrum fluorescent lighting with standard fixtures. There is no improvement in sight for natural photosynthetic light-energy capturing mechanisms; what we are striving to do is artificially replicate conducive lighting conditions at a reasonable cost. The best way to do this since the late sixties is with full-spectrum fluorescents. Frados, Andrew. 1986. The Importance of Light in the Aquarium. T.F.H. 7/86. Illuminating Engineering Society. 1984. IES Lighting HandbookVol. 1 Applications, Vol. 2 Reference. Osborne, Kevin. 1982, 83. Full Spectrum Lighting in the Planted Aquarium. FAMA 12/82, 1/83. Osborne, Kevin. 1994. Lighting & the Planted Aquarium, pts. 1,2,3. FAMA 1,2,3/94. Ostrow, Marshall E. 1979. Lighting Your Tank. T.F.H. 6/79. Pillai, Joe Bastian, M.I.E., 1990. Lighting For Aquariums, A Study of Terms. The Pet Dealer, 3/90. Smit, George. 1986. Marine Aquariums, Part Two: The importance of light. FAMA 2/86. questions and providing technical information.